GGP is looking for Norwalk to approve a plan for The SoNo Collection to be built without a hotel. Updated, 12:10 p.m.: Clarification about Bloomingdale’s lease. 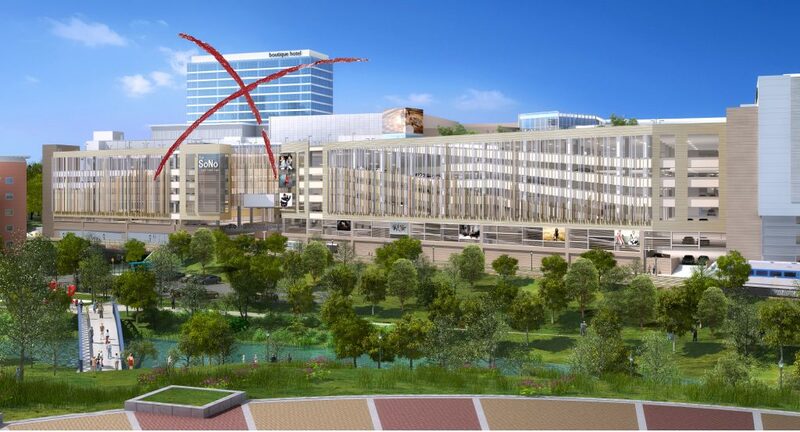 NORWALK, Conn. — The SoNo Collection will not be a purely luxury center, but a Class A mall with a broad mix of retailers, GGP Vice President Doug Adams said Thursday. Also coming out of the Common Council Planning Committee meeting is the news that Nordstrom is committed to a 20-year lease in the center, with Bloomingdale’s having a similar commitment, and a comment that Norwalk tried to get $7.5 million out of GGP as compensation for dropping the hotel from the plan. “The city asked for a lot of money. Quite honestly, at one point, the developer got up and walked out and didn’t respond again for a couple of weeks. Then they came back. … with a number of that was in the range of what the leadership felt was fair. When they did, we said it should go to the Council and the Redevelopment Agency to see if it was sufficient,” Attorney Eric Bernheim said, in response to Council member Faye Bowman (D-District B). The city announced on April 11 that it and the Redevelopment Agency had “reached an agreement with GGP, the developer of The SoNo Collection, to move forward towards the start of construction.” This deal — worked out in months of talks between Mayor Harry Rilling, Council leadership, Redevelopment leadership and others — included GGP paying the city $3.5 million in lieu of building a hotel. There will be up to six public hearings on the proposals, Redevelopment Agency Executive Director Tim Sheehan said, including a Planning Commission meeting and a Zoning Commission public hearing. Some of the conversation at Thursday’s meeting centered on comments made by GGP CEO Sandeep Mathrani in a Monday morning earning’s call. “How should we view ‘everything on the table’? What does that mean?” Council member Tom Livingston (D-District E) asked, mentioning that he had been a securities lawyer. “I am not a securities lawyer so I am unsure what to say,” Adams said. The value of GGP’s assets, as assessed by the market, are significantly above the net asset value of the company, and GGP has a duty to its shareholders to maximize the return on the stock, Adams said. Mathrani also said GGP is considering increasing the retail square footage of The SoNo Collection. He was speaking about Gross Leasable Area (GLA), Adams said, explaining why Mathrani said 300,000 square feet of retail when the mall is planned for 660,000 square feet. GGP is looking at renting more space for small stores between the anchors, fulfilling the maximum allowed in the Land Disposition Agreement, 700,000 square feet. “Had a lot of questions the past few days, ‘Are we going to be back in asking for an increase?’ The answer is no,” Adams said. “Do you anticipate filling the 300,000 GLA?” Livingston asked. Bernheim, who is an independent legal counsel hired by Norwalk as a consultant on The SoNo Collection, said he had reviewed GGP’s leases with Nordstrom and Bloomingdale’s last week. The leases are confidential and he could not take notes or keep copies, but Nordstrom has a fully executed, lease for 20 years, with six 10-year options, and a notice of lease has been filed in the land records, he said. Bloomingdale’s lease is also fully executed, but a notice of lease has not been filed yet, he said, calling the terms “very similar” to Nordstrom. “I think that for all intents and purposes, the city should feel very confident, unless something goes very awry, that they will have Nordstrom and Bloomingdale’s when the mall opens,” Bernheim said. The Redevelopment Agency analyzed how much GGP would have paid for the hotel in 10 years worth of property taxes, Sheehan said. That’s 10 years at full price, no reduction for an Enterprise Zone, he said. “I ran it at full value, based on existing hotel rooms,” Sheehan said. “If you add the present value it turns out to be 17 years,” Bernheim said. Bowman said she found out about the deal in the paper. “We got feedback on the meetings, it was no secret to the Democratic caucus,” Council member Bruce Kimmel (D-At Large) said. Bowman, who does not attend caucus meetings, protested that nothing had been put into emails. The leadership came up with something to bring to the caucus, Majority Leader John Kydes (D-District C) said. “I don’t see what the rush is. I am totally interested in really getting into details,” Bowman said. “Certainly, you guys aren’t obligated to rush into anything that you are uncomfortable with agreeing to,” Bernheim said, explaining that the leases GGP has with Nordstrom and Bloomingdale’s call for the mall to open in October 2019. Bernheim said he has no expertise in mall construction but GGP has been very consistent in saying that it needs to begin construction now to open in October 2019. “If you take them at their word, that this needs to happen so they can get the project, so the city can have a project, that is the reason for the rush,” Bernheim said. Attorney Larry Cafero, representing GGP, said that within a two week period GGP will have paid Norwalk nearly $2 million. That’s the money already paid as part of GGP’s commitment to a circular, the easement over North Water Street, a fee for the water treatment plant and the fee for a foundation permit, he said. Just curious, was there a formula involved in the request for $7.5M? Was it just an arbitrary figure devised to assuage the Norwalk voters and inflict some monetary “pain” on GGP? $4M is a big spread. This was a negotiation, not a court case. If there was no basis for the larger request, who could be shocked that GGP balked? I’ve never had a business negoitation where the other side kicked in just to be nice guys. Now is the time for Norwalk to “Get up and walk out of the room and not respond for a few weeks”. GGP needs this approval for this “premier development that investors are lining to be a part of” (GGP CEO’s words). How about they give the City $3.5MM and an equity stake in the Mall. How about eliminating the enterprise zone so we can collect the full Tax revenue. This project is dead without Norwalk and GGP needs this badly. Norwalk needs to push back hard this time. Seems to me that our elected officials and redevelopment agency folks are all really only asking one question of GGP: “How high?”, and I don’t mean regarding the hotel payoff amount, folks…. Right on the mark. Our leadership may have asked for double the 3.5 million. But did they ever ask for any other concession from GGP? If they can’t negotiate a good deal for South Norwalk, how can we trust that these same people will spend the 3.5 mil kickback wisely? GGP reps aren’t dummies. They would rather hand out what amounts to chump change for them than be bothered with circulators, hotels, sidewalks, public spaces and other enhancements that would directly benefit Norwalk. Make GGP deliver on direct enhancements to the commmunity. There has to be more for Norwalk here than fees and taxes. The mall itself must be good for the community with walkable open space for Norwalk residents. Have to recreate a formula I did a couple weeks ago but the result of my basic math using similar local hotel property tax rates resulted in $6.8 million payoff as a minimum starting point. City leaders should have left room in laughter at the $3.5 offer. Given that the circulator payment was for the CIRCULATOR and was already part of the deal, nobody should be discussing it in the context of compensation for removing the HOTEL. Please stop negotiating with yourselves, fer cryin’ out loud. I just don’t think it’s in the interests of the city to take $ in exchange for enhancements, whatever they are. Mostly I don’t have faith in the Mayor, the redevelopment agency and the CC to direct these funds reponsibly. GGP should lead the project. Easy for GGP to kick back to the City funds for things they don’t want to do.